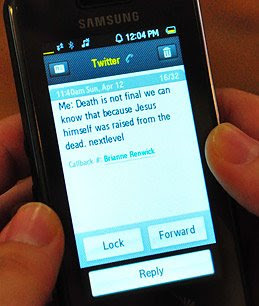 Not so long ago, for a person to employ a BlackBerry or an iPhone during a worship service was deemed the height of irreverence. But increasingly it's not only grown acceptable, it's becoming encouraged. Time Magazine has a story about churches that have adopted Twitter - the micro-blogging utility that's become all the rage - as a a tool for edifying, evangelism and Bible study. As one person in the article points out, Twitter makes it possible to actively write and save notes from that day's sermon, without having to ever again misplace what you jot down. As an added benefit, those who are somehow unable to "be there" can keep up along with the rest of the congregation. Don't ask me why but I think it's creepy...I just do.